When Helia was 12 years old, her mother began to notice she was always very thirsty and drinking more water than usual. It got to the point that Helia was losing sleep due to all the weight she gained, so her mother decided to consult with a specialist. Read this story. Oscar, 20, was born with Sickle Cell Disease, a condition that affects red blood cells (sickle cell anemia) and blockage of blood flow causing pain. The pain is often so severe; patients suffer painful bouts known as sickle cell crisis and often require hospitalization. Read this story. When Mateo was just two years old, his parents were shocked to discover that their toddler developed leukemia. They met with the hematology and oncology specialists at Nicklaus Children’s Hospital and began a treatment protocol that brought Mateo back to health—along with some entertainment from his spirited little sister! Mateo, now 10, is a healthy, typical kid who loves running around with his friends. Read this story. At a young age, Bi’Yanie was diagnosed with sickle cell, a blood disorder that causes the cells to take on a crescent or sickle shape and can lead to very painful episodes called crises. Today, Bi’Yanie is getting stronger by the day, thanks to the bone marrow transplant she received at Nicklaus Children’s Hospital. Read this story. While her high school senior peers were trying on prom dresses and applying to college, Sydnie Romero was grappling with a decision that would be tough for anyone, let alone a chronically ill 17-year-old. Sydnie was born with sickle cell disease, a genetic disorder in which bone marrow produces defective hemoglobin that can block blood supply to parts of the body, resulting in “pain crises,” which are episodes of severe pain that can last for hours to days. Kira, 13, can say “I beat cancer” in four languages: English, Portuguese, Italian and Spanish. The budding linguist and aspiring make-up artist (at least for the moment) is happy to have cancer in the rear view mirror after a 2014 bone marrow transplant that cured her of acute lymphocytic leukemia. Read this story. At just 16 years old, Raquel was diagnosed with Pre-B acute lymphoblastic leukemia. She first noticed something was wrong in the summer of 2015 when she realized she had swollen glands behind her ear. Read this story. 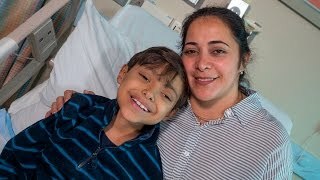 When he was just a young boy in Nicaragua, Felix’s mom noticed that he often complained about pains and not the usual pains for an active boy his age. After he was taken for blood tests, doctors discovered that Felix had sickle cell disease. Read this story. Thriving after undergoing bone marrow transplant from two donated umbilical cord units, Sabrina celebrates her 15th birthday after sucessfully recovering from the transplant to treat her Leukemia. Read this story. 14-year-old Caroline Pallidine found the care she needed to overcome leukemia and the strength to face the world without the once-flowing tresses she lost to chemotherapy.Caroline was hospitalized in the Oncology Unit in July 2011, when a visit from musician Armando “Pitbull” Perez, as part of the national “Get Well Soon Tour,” inspired her to shed the wig she had been wearing when out in public. Read this story. Natalie Thompson of Hobie Sound, Florida, was only 2 when doctors at Nicklaus Children's diagnosed her with stage IV neuroblastoma, an aggressive childhood cancer. Little Natalie, now 4, has completed her 120-week treatment and is cancer free. She is enjoying life and making huge strides in regaining ground lost during her prolonged illness. Read this story. Jessica was a patient five years ago. She moved to Nicklaus Children's Hospital from Palms West in West Palm Beach because she had a large brain tumor and hydrocephalus. Her parents weren't sure she would make it but today she is a survivor because of Nicklaus Children's Hospital. Read this story. In May of 2008, Andrea was diagnosed with a brain tumor in the brain stem. She was admitted to the Nicklaus Children's Hospital, formerly Miami Children's Hospital, for surgery and treatment. Read this story. Carin was diagnosed with medulloblastoma (a highly malignant primary brain tumor) at age eleven. She was operated on to remove the tumor, and she also had radiation treatments. She is thirty seven years old now and lives and works in Ohio. Read this story. Nine-month-old Amanda was diagnosed with stage 4b unilateral retinoblastoma. Retinoblastoma is a rare, cancerous tumor of a part of the eye called the retina. Ten years later, Mandi is a very active honor roll student, has modeled and done commercials, and is regaining minimal vision in her affected eye. Read this story. David was ten and a half years old when first diagnosed with glioblastoma, a stage 4 brain cancer, in his right temporal lobe. After going through thirty three radiation treatments and being told he had only three months to live, Dave recovered and is cancer free. Read this story. In December 2008 Karly went to the emergency room for a high fever and cough. The doctors said she had pneumonia, then a CAT scan two days later showed that she had a tumor in her chest the size of a softball that was collapsing her left lung and compressing her spine. The next morning, Karly was taken via Life Flight to Nicklaus Children's Hospital, formerly Miami Children's Hospital, where a great oncology team was ready to treat her. Read this story. Little Jeffrey, now 10, was born with sickle cell disease, a genetic disorder in which bone marrow produces defective hemoglobin that can block the blood supply to parts of the body, resulting in painful episodes and potentially debilitating strokes. Jeffrey's family have nothing but wonderful things to say about the doctors and staff at Nicklaus Children's Bone Marrow Transplant Program. Read this story. At 15, Jany knows not to sweat the small stuff. In the months since she was diagnosed with cancer, the Westwood Christian School sophomore has gained a rare perspective on life.Today, Jany is cancer-free and pursuing her education at home while waiting for her immune system to regain strength. Read this story. Destiny has worked her magic while battling a persistent form of cancer. The journey began when two large tumors – one the size of a fist – were found in Destiny’s brain when the child was just 18 months old. Within a day of the diagnosis, Destiny was in the hands of Nicklaus Children's neurosurgeon Dr. Glenn Morrison, who successfully removed the tumors. Read this story. Daniella dreams of being a pediatric oncology nurse - not a common career ambition for a teenager. But Daniella is not your typical teen. The determined 16-year-old has faced a highly aggressive form of cancer and has been disease-free for three years. Read this story. Bria was taken to the Cancer Center at Nicklaus Children's Hospital, where her family learned she had an aggressive form of bone cancer, called osteosarcoma, in her left thigh. With the care and compassion Bria and her family received at Nicklaus Children's Hospital, today this energetic third grader is showing the world how to beat the odds. Read this story.